We are pleased to invite you to join the Palmaz family on our next culinary adventure. For the past several years, we have been restoring a historic cattle ranch in the Sierra Mountains. There, we began raising 100% pure-bred Wagyu cattle to produce exquisite grass-fed beef in the most humane and environmentally sustainable manner possible. At last, our passion for great food and wine is complete. After years of meticulous preparation, we are ready to share with you the perfect pairing for our Napa Valley wines. This extraordinary beef will be made available as a ranch subscription add-on to a select number of Brasas members. Ranch Memberships for 2018 are sold out. Now accepting sign-ups for 2019. *Existing active memberships do not require renewal. Over the course of a year you will receive a complete 1/6th of the cow in easy to store and prepare packages. 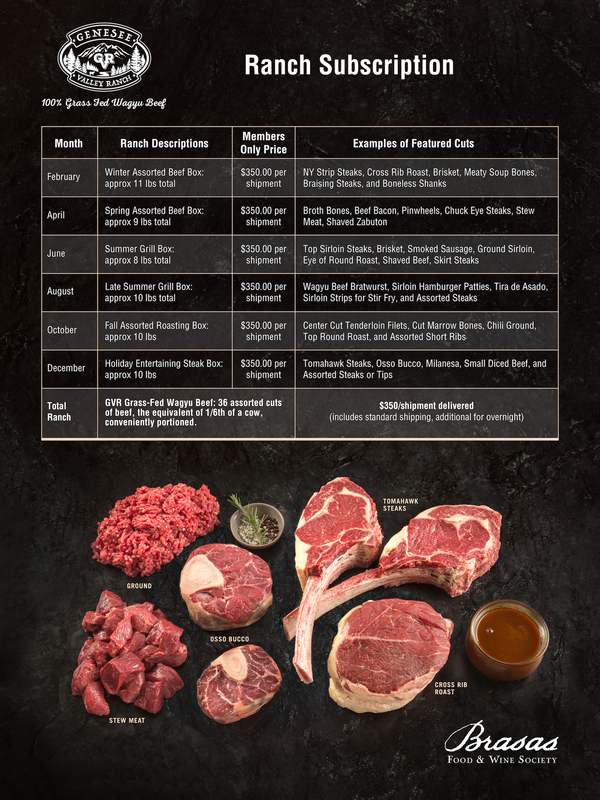 Each bi-montly shipment will contain 8-10 packages of assorted cuts of beef with accompanying literature on each cut’s origins, recipes, and suggested pairings. Brasas ranch membership will not only stock your kitchen with incredible beef but will also expand your knowledge of butchery. 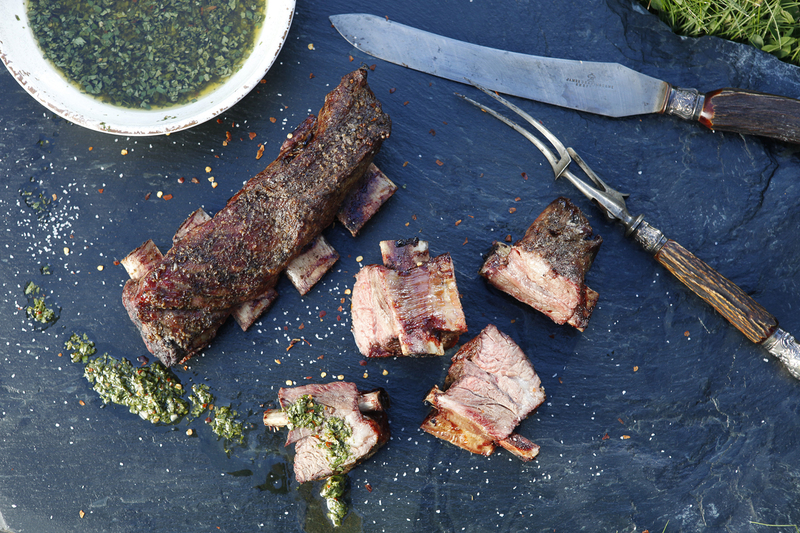 Discover how different cultures approach cooking with the world's most coveted beef. As a Brasas Ranch subscriber you will receive extraordinary quality beef that has been sustainably raised and responsibly sourced. The luxury food industry is rife with waste, but with our ranch subscription no part of the animal has been wasted. Established as a ranch in 1862, by Edwin D. Hosselkus, the ranch has deep roots in Gold rush history. Four generations of this family kept the ranching tradition alive and founded the town of Genesee, CA featuring a general store, post office, creamery, and granary. Today the Palmaz family have restored the grasslands, brought back the cattle, and revived the abandoned general store/restaurant in hopes of honoring and preserving the agrarian tradition of the Genesee Valley. For more information check out the ranch’s website. The Wagyu breed is valued for its superior marbling. But GVR’s holistic ranching practices further contribute to the beef’s delicate texture and flavor. The result is a luxurious and humanely nurtured beef, remarkably different from its commercially available counterpart. GVR offers 100% purebred Black Wagyu Beef raised on organically grown grass pastures. Our ranching practices are centered around the tenet that great beef comes from well-treated animals. The cattle are never aggressively handled, grain-fed, or confined to unnatural small spaces. These animals are pasture-raised solely on a diet of diversified grasses. Each field is rotated with a variety of native grasses to ensure that both the land and the cattle benefit from a sustainable, environmentally sensitive management program. GVR respects the land and anticipates the needs of the animals in a holistic way. The result is a balanced beef, bringing together the best of luxury and sustainability. Wagyu cattle is revered as the most coveted breed for quality beef in Japan. Originally Wagyu was bred as a pack animal. The breed’s unique ability to retain fat in its muscles was encouraged over the centuries to enable the animal to store energy needed to travel long distances. Subsequently it was discovered that these energy efficient cows yielded an ultra luxurious beef. The meat from a Wagyu cow is immediately recognizable for its distinctive lace-like marbling that can be seen on the uncooked steak. The lower melting point of the fat finely distributed in the steak literally contributes to the “melt in your mouth” texture of this beef. At GVR we take the traditions of Wagyu breeding and conformation seriously. Efforts are taken to track the pedigree of all our animals and ensure that no cross-breeding has diluted the pedigree of our prestigious herd.